No - not that Oscar. Although I am so tickled that Helen Mirren won! And I thought Ellen did a great job as host. But, I digress. No, I'm talking about another Oscar - my cat Oscar. Oscar de la Renta. I just couldn't resist this title for my post today (for obvious reasons), but were it not for such a timely and clever coincidence, I would have entitled it "The $1000 Hair Ball". No kidding. At the rate we're going, we may just be paying for a new wing at Tender Touch Animal Hospital. 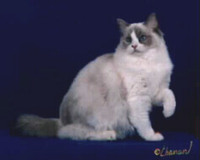 This was "Oscar de la Renta" in the prime of his career as a famous Ragdoll show-cat before he adopted me and came to live in our house. "Oscie" enjoys retirement snoozing in the garden catching a few rays on a warm winter day. A healthy kitty -- priceless. I was so happy to come home from my last road trip to find he's back to his chipper cat self. So, this was my most expensive fiber related expense ever (all at one time anyway)! And not even a sweater to show for it. I do actually save Oscar's fur from his combings for spinning, but this? Eeww. Everyone has been so kind to send good wishes to Humphrey as he continues to recover from his torn ACL operation. No running or jumping yet, but just want you to know he's doing well. Thank god, you sell Noro and Debbie Bliss so you can pay those vet bills! Oh, and I totally agree with you about Twinkle Knits. Now I hate them. Thanks! Now that certainly is one heck of a fiber related issue. Glad to see that the animals are on the mend. Want another dog? I had Sophia up for adoption on Sunday. She went on a bit of a walk about. Give the animals a little pet from me! I'm glad that Oscar is getting back to normal. LOL on the fibre purchase. I see the Duchess has been by, we will be out misbehaving for the month of March.